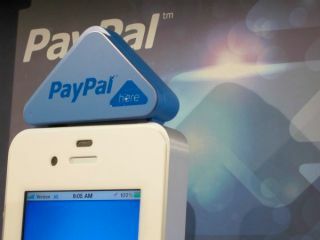 PayPal has launched an iPhone-friendly credit card reader and plans to enter into direct competition with the well-established Square ecosystem. PayPal Here is a small, triangular, blue dongle that plugs into the iPhone's headphone jack and allows vendors to accept payments for goods and services wherever they may roam. Like Square, launched by Twitter founder Jack Dorsey, PayPal Here uses an iPhone app which, once the card is swiped, allows a merchant to type in the amount. The phone can then be passed to the customer to check the amount and sign, using the device's touchscreen. Both the app and the card reader are encrypted. Beyond that, there's also a Scan Card feature, which doesn't require the dongle, but will need the seller to type in the zip code and three-digit security number on the back of the card. As for PayPal's end, the company will take 2.7 per cent per transaction, compared to Square's 2.75 per cent charge. PayPal is also giving out free PayPal debit cards, which can be used to withdraw cash from a local ATM as soon as a sale is made and, with each transaction offering 1 per cent cash back, it effectively lowers the fee to 1.7 per cent. The service will launch in the United States, Australia and Hong Kong initially and will come to the rest of the world soon. However, despite undercutting Square, the company has a long road on its hand to eclipse the mobile payment pioneer. Square took in $4 billion in revenue last year, has found its way into New York taxis and recently launched the Square Register app, which threatens to make the traditional cash register a thing of the past.